Airy dhoti pants, palazzos – girls' must-have this summer! Who wants to wear skinny pants and thick denims in the sultry heat? Think out-of-the-box and team up your kurtis, kimono tops, tanks, and t-shirts with loose but comfortable dhoti pants and palazzos in cotton, to raise the heat on your fashion scale. They are a rage today – palazzos, which are long, super wide-legged trousers, and dhoti pants, a modern interpretation of the old-fashioned dhoti. Both are stylish and are being picked by college-goers and party hoppers alike. Be it flea markets or designerwear, the bottomwears are seen everywhere today. “As the summer sets in, girls are quick to ditch denim and other heavy fabrics. Comfort is the new style and therefore dhoti pants and palazzos are becoming popular,” Delhi-based designer Jyoti Sharma told IANS. For the brand-conscious crowd that wishes to pick dhoti pants, Indian names like Tarun Tahiliani, Krishna Mehta, Payal Pratap Singh and Masaba Gupta, and international fashion houses including Yves Identify, Ralph Lauren and DKNY have various designs on offer. Each has its own interpretation. The best part about the garment is that there are hardly any fitting hassles as they are meant to be loose and free-flowing. “As far as the fit is concerned, only the size (of the waist) has to be right for you and it will fit fine. These garments are primarily loose to let air flow easily and let your skin breathe; so fit is not of importance here,” added Sharma. Tahiliani, who is known nationally and internationally, has focussed extensively on variations of the dhoti at several fashion weeks over the years. From an elegant drape to a more structured version, he usually teams up the garment with ponchos, tunics and sometimes t-shirts. But while all of it looks trendy on tall and slender models, does the look suit the girl-next-door variety as well? “Dhoti pants, contrary to popular opinion, create a perfect balance between simplicity and fashion as they are not shape-appropriate. While they add volume to the petite women; dhoti pants work wonders for curvier women as well by taking away excess volume to the lower body if shaped appropriately,” designer Krishna Mehta told IANS. 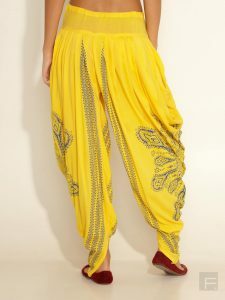 In one of her lines, Mehta played with monochrome tie-and-dye dhoti pants to give it a modern twist. Masaba Gupta, known for her colourful designs, sells a lot of dhoti pants in vibrant colours and quirky and sometimes kitschy prints. The forms of dhoti pants can be varied – cropped, printed or embellished – but choose to team it well. “Pair a monochromatic tie-dye pant with funky belt, statement jewellery and heels for a modern gypsy look or with a blouse or a camisole for a more feminine look. Complete the look with heels, flat, mojaris, gladiators or even regular chappals,” added Mehta. Also, why must girls have all the fun with dhoti pants? Men are also experimenting and wearing them with a long shirt, bandhgala jacket, shirt and blazer for a chic look. The trend has gone international too – Tamil actor Simbu recently made international R&B singer Akon wear a veshti (dhoti) when the latter was shooting for the music video of the global version of his hit love single “Love Anthem”. As far as palazzo trousers are concerned, they seem to be back in fashion after being popular in the 1960s and 1970S. They flatter the waist and suit your look wherever you go – work, play or party. Play around with palazzos in different colours and prints, but choose the fabric carefully. “It could be in pure or mixed cotton. Those with cotton lace and chikan (work) are also popular choices in pallazos. Chiffons are good too. Prints are big this season; so everything from the Mediterranean to the tropical prints to black and white to neon – they are all a big hit,” said Sharma. Make sure you wear palazzos with a well-fitted top. “Since these are loose garments, they look best when paired with a well-fitted top. Two loose garments do not look good together. You can add a burst of colour by wearing a neon accessory like a bold neckpiece,” Sharma said.